The Division of Biology at Kansas State University invites applications for two faculty positions in Ecology, starting in fall 2019. We seek candidates with expertise or interests in grassland and/or savanna biomes that will complement a well-established and diverse ecology group in the Division of Biology, and contribute to the highly productive, internationally recognized Konza Prairie grassland ecology research program. We are particularly interested in candidates with expertise in community ecology, animal-plant interactions, trophic dynamics, or research at the interface of community and ecosystem ecology. In addition to conducting research in his/her area of expertise, the successful candidate will participate fully as a core investigator in the highly collaborative NSF-funded Konza Prairie Long-Term Ecological Research (LTER) program (lter.konza.ksu.edu), and contribute to graduate and undergraduate instruction in ecology, conservation biology and/or wildlife biology in the Division (www.ksu.edu/biology). The successful candidate will have a strong record of research productivity, will participate in interdisciplinary research and develop collaborations across a range of ecological disciplines. A Ph.D. or equivalent is required. Applications for this position must be submitted electronically at http://careers.k-state.edu/cw/ en-us/job/504642/. Applicants should submit a cover letter, description of research and teaching interests, a curriculum vita, and names and contact information for three references. The research area of this position is open. However we are particularly interested in individuals with expertise or interests in environmental change in grasslands or savannas. Specific research foci could include one or more of the following areas: plant ecology, landscape ecology, conservation biology, land-use and land-cover change, restoration ecology, climate change, or other aspects of environmental change. In addition to conducting research in his/her area of expertise, the successful candidate will participate as a core investigator in the highly collaborative NSF-funded Konza Prairie Long-Term Ecological Research (LTER) program (lter.konza.ksu.edu), and contribute to graduate and undergraduate instruction in ecology, plant biology, and/or conservation biology in the Division (www.ksu.edu/biology). A Ph.D. or equivalent is required. Applications for this position must be submitted electronically at http://careers.k-state.edu/cw/ en-us/job/504643/. Applicants should submit a cover letter, description of research and teaching interests, a curriculum vita, and names and contact information for three references. The Division of Biology is a large and diverse academic unit with an excellent record of research and teaching. Extramural research funding in the Division averages approximately $10M per year, supporting a broad research program and a large number of faculty scientists with research interests in ecology. The Konza Prairie Biological Station, a 3,487 ha tallgrass prairie research site located 10 km from the university, is the focal site for much of this research (kpbs.konza.k-state.edu/). 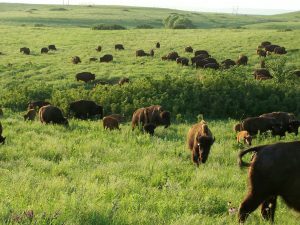 Research on Konza Prairie is supported by the NSF LTER program and a variety of other sources, totaling over $3M per year. Kansas State University is located in the city of Manhattan, a vibrant university community of about 50,000 located in the scenic Flint Hills of northeastern Kansas, about 2 hours from Kansas City. Local recreational opportunities include a large lake/park system and diverse outdoor activities. Manhattan also serves as the regional center for education, health care, commerce, the performing arts, entertainment and communications. Please note that individuals interested in applying for both positions must submit separate electronic applications to both job numbers indicated above. Questions or requests for additional information can be directed to David C. Hartnett (dchart@ksu.edu). Review of applications will begin October 5, 2018, and continue until the positions are filled. KSU is an Equal Opportunity/ Affirmative Action Employer, and actively seeks diversity among its employees.